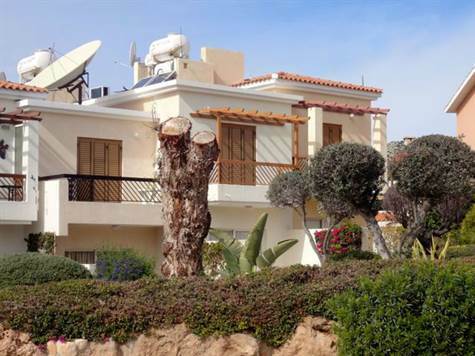 Cyprus Property Blog by Cleo : Price Improved - Spacious, furnished townhouse in Peyia w/ Deeds - only 95,000 Euros! Price Improved - Spacious, furnished townhouse in Peyia w/ Deeds - only 95,000 Euros! Peyia, Paphos - This 2 bedroom spacious townhouse is located in Lower Peyia near to a wide variety of local amenities and the popular holiday resort of Coral Bay, which is known for it's beautiful sandy beaches and crystal blue sea. The ground floor features a split-level open plan living area including lounge, dining area, corner kitchen and cloakroom. Patio doors provide easy access to a private garden and the communal gardens and pool beyond. Upstairs there are two double bedrooms with fitted wardrobes and a good size family bathroom. The master bedroom has a balcony overlooking the swimming pool and beautifully landscaped gardens and there is a distant sea view. The property is suitable as a holiday or permanent home and comes fully furnished with title deeds available. To the rear of the property is a driveway for parking. Please refer to MLS#: 1357 when inquiring.